State House, ENTEBBE – President Yoweri Museveni has hosted his former teachers who taught him at Ntare School in Mbarara District, Western Uganda in the 1960s. The teachers were hosted at State House in Entebbe. 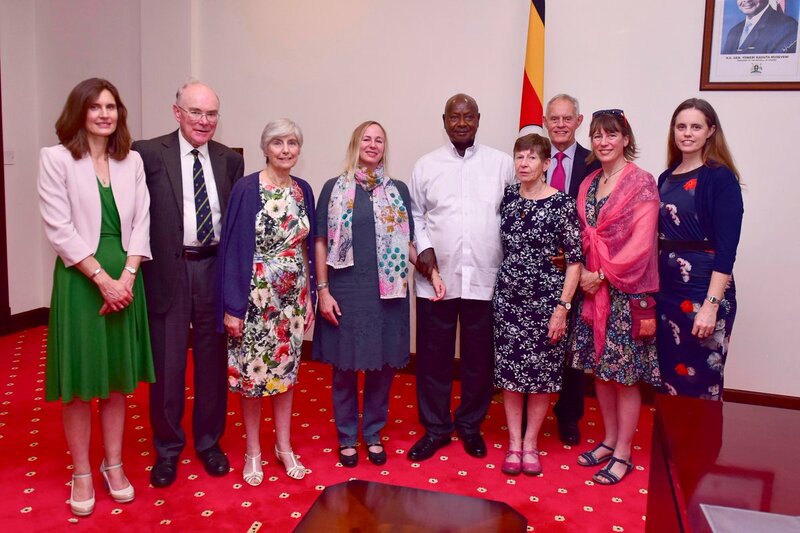 The delegation from the United Kingdom that arrived in Uganda on Friday includes teachers Mr Collins Gregory who taught Physics, Mr Nicholson John, a Chemistry teacher and Mrs Mary Sullivan whose late husband was a teacher of Geography. They were accompanied by some of their respective family members. During their interactive talks, the President and his guests shared memories about Uganda back then and other educationists who served in schools like Mbarara High School. Mr Collins Gregory expressed delight at the development strides Uganda has taken in all sectors while Mr Nicholson John expressed happiness to have offered his services in the education sector while at Ntare School. The former teachers told the President that their children feel gratified that one of their parents’ education products is a Head of State in Africa. Museveni shared with his former teachers’ books of literature, publications about Uganda some of which are the President’s personal publications.